Including two aircraft carriers, four amphibious ships, three cruisers, and 13 destroyers. The U.S. military had a multitude of forces in the region surrounding Libya when terrorists attacked the Special Mission in Benghazi and murdered four Americans, according to an unclassified Navy map obtained by Judicial Watch this week. 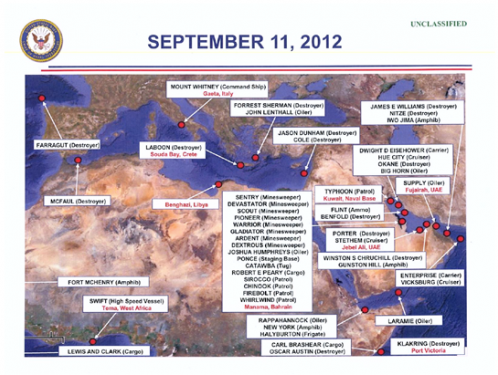 The map features the Navy fleet positions in the North Africa Area of Responsibility (AOR) on September 11, 2012, the day Islamic jihadists raided the U.S. Special Mission in Benghazi. Ambassador Christopher Stevens, the first diplomat to be killed overseas in decades, and three other Americans were murdered in the violent ambush. Dozens of vessels were stationed in the region on that day, including two aircraft carriers (Dwight D. Eisenhower and Enterprise), four amphibious ships, 13 destroyers, three cruisers and more than a dozen other smaller Navy boats as well as a command ship. Carriers are warships, the powerhouse of the naval fleet with a full-length flight deck for aircraft operations. During the Benghazi attack, two carriers were based to the east in the Arabian Sea, the Navy map shows. Two amphibious assault ships (Iwo Jima and Gunston Hill) were situated to the east in the Gulf of Oman and one (New York) was in the Gulf of Aden, the map shows. A fourth (Fort McHenry) was located on the west side of the African continent in the Atlantic Ocean. Amphibious ships resemble small aircraft carriers and have air-craft strips for vertical and short take-offs and landings. The destroyers are scattered throughout the region, but the closest appear to be four (Cole, Forrest Sherman, Jason Dunham and Aboon) in the Mediterranean Sea north of Libya. The rest of the fleet includes cruisers, minesweepers, patrols and a command ship. The map was provided to Judicial Watch by retired Air Force Lieutenant Colonel Randall R. Schmidt, who is investigating how the military responded to the Benghazi attack. Schmidt flew jet fighters during his active duty and says there’s no reason the military could not have efficiently responded in Benghazi. Schmidt got the map after filing a Freedom of Information Act (FOIA) request with the Navy asking it to identify the location of all its assets in the region on September 11, 2012. This could be the smoking gun which proves the military was commanded to stand down. From the CIC perhaps? Or Secretary of State ? Wither way what will be done about it ? Nada. Now if there were anyone left who cared. It'd be nice to hear some outrage, but who controls the thoughts these days? Seems like the Dems have the press in their pocket and there's no danger of that changing. The President feels so confident in his lock on the media that he can challenge FOX publicly [during in his interview with BOR]. And did anyone challenge Zero for criticizing FOX news? Did any other network defend the FOX News? Not that I heard. Christianity teaches to share what we have earned, the "cheerful giver" model. Seems like whoever controls the press controls the people. The modern press is propaganda in its finest hour. Goebbels could only have dreamed of having the press we have today in his pocket! Sad state of affairs. That traditional American trait of raucous questioning of authority has been suppressed in favor of consensus, reaching across the aisle. Disagreement with the pronouncements of the PTB is roughly equated with treason and heresy. Adult reason and logic have been replaced with childish emotion.